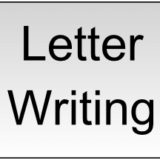 Write a letter to your father informing him about your studies. Write a letter to your father requesting him to allow to go on an educational tour. Write an application to the Principal of your school explaining why you did not take the second term test. Letter to your friend to lend his camera. Write a letter to your friend inviting him to attend your younger sister’s marriage. Write a letter to your friends inviting him to pay you a visit during Dussehra Holidays. Write a letter to your uncle thanking him for a gift. Write a letter to the Police Station Incharge Officer reporting the theft of your bicycle.